About the Project: The project was commissioned by International Development Enterprise - Bangladesh (IDE-B). It is part of an initiative under the Cereal Systems Initiative for South Asia – Irrigation and Mechanization (CSISA‐MI), a program jointly run by IDE-B and International Centre for Maize and Wheat Improvement (CIMMYT) and is funded by the USAID Mission in Bangladesh under President Obama’s Feed the Future (FtF) Initiative. 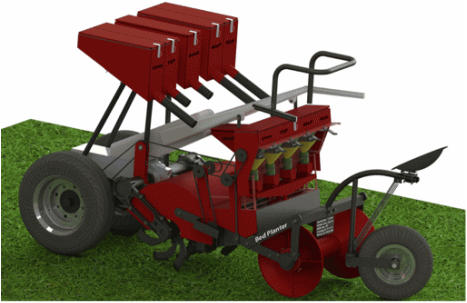 ​About the Product: A two-wheel power tiller based Bed Planter was designed with a Human Centered Design Approach. The Bed Planter first pulverizes the soil and then applies seed and fertilizer at the required depth and gap. It thereafter covers up the seed and fertilizer with soil and creates a soil bed. The operator can choose to operate the machine by riding on it or walking beside it. The product was collaboratively designed and developed with an active participation of all stakeholders - Agricultural Scientists & Engineers, Farmers, Bed Planter Operators, Manufacturer, Distributors, Local Service Providers, Trainers and Field Staff of IDE-B and CIMMYT.